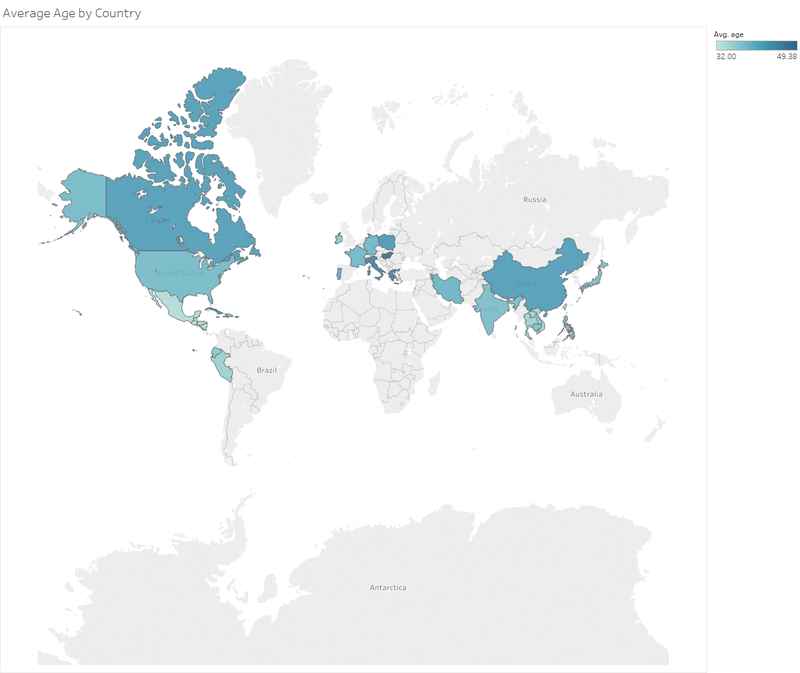 This guide explains how to connect KNIME Analytics Platform with Tableau®. There are a few methods you can use to do this, and the text below describes these methods in further detail, while walking through an example KNIME workflow. Navigate to File → Install KNIME Extensions and type "Tableau" in the search box that appears. When you do, you will see something like the screen below. If you have Tableau 10.5 or later, you can use the .hyper format, which is created using the Tableau Data Extract API 2.0. Versions 10.4 and earlier use the older TDE format, which is created using the Tableau SDK. Select the extensions to install according to what you need. If you are not sure, you can install both, and tell KNIME which format you want to use later. 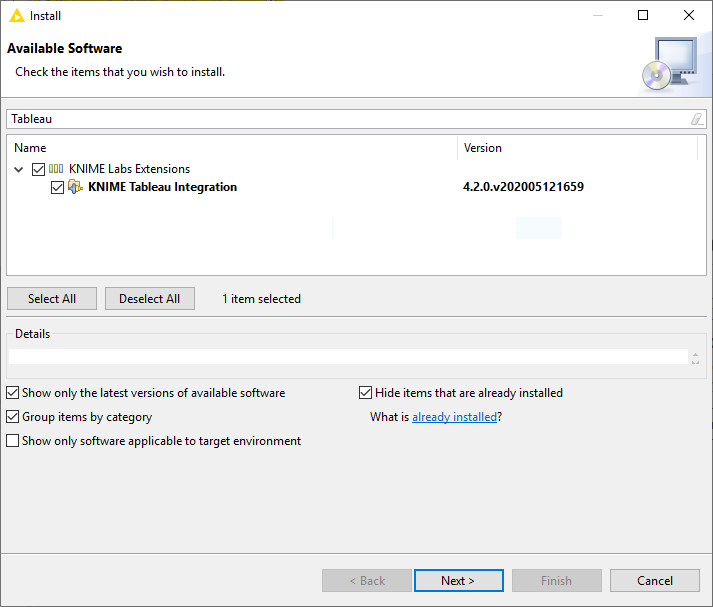 The two extensions labeled KNIME Tableau Integration include the KNIME nodes, while the other extensions labeled Platform Specific Packages include the back-end support files - specifically, the Extract API or SDK files. Additional information on the differences between the TDE and .hyper formats, along with the changes implemented in Tableau 10.5, can be found on the Tableau website. Once you have installed the extension(s), restart KNIME Analytics Platform and you should see the Tableau nodes in the node repository under KNIME Labs. 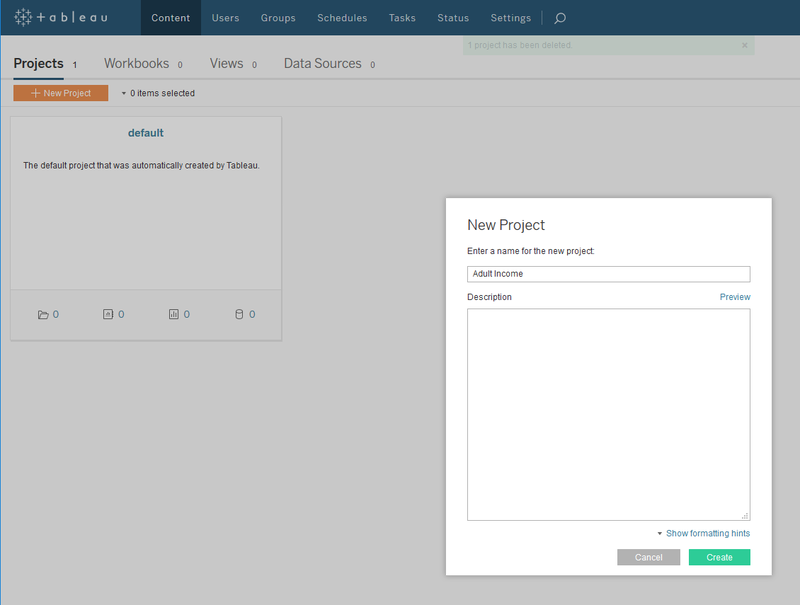 You can now drag and drop the Tableau nodes into your workflow, but you will need to perform some additional one-time setup on your system PATH before they will export data properly. Go to File → Preferences → KNIME and find the Tableau page. Here, you can select whether to use the current .hyper format or the older TDE format. Changing this setting requires a restart of KNIME Analytics Platform. Importantly, you will need to add the string in the text box to your system’s PATH. If you are not sure how to do this, click on the blue Instructions link to open a page that describes the process in more detail. You can click the Copy to Clipboard button to assist in this process. Once you have updated your system’s PATH to include either the Tableau Extract API 2.0 (for Hyper) and/or the Tableau SDK (for TDE), restart KNIME Analytics Platform. Some Windows users may also need to install the Visual C++ 2013 redistributable, but many Windows 10 installations already include it. A link to the redistributable is provided if you do need it. The URL of your Tableau server. 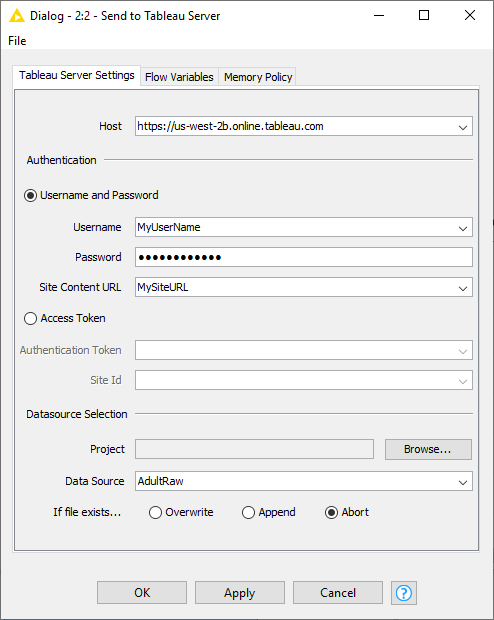 In your KNIME workflows, you must use the redirected specific URL — for example https://us-west-2b.online.tableau.com — and not the general URL https://online.tableau.com. Also, take particular care to use the secure https-protocol. Your Tableau site ID. For Tableau Online, this can be observed within the URL itself. Given the URL https://us-west-2b.online.tableau.com/#/site/ExampleSite/projects, the site ID is ExampleSite. You will also need to have a Tableau Project already in place on the server. By default, Tableau Online creates a default project for you, but it is a good idea to create one and give it an appropriate name. You can do this in Tableau Online by navigating to the projects section and clicking on the New Projects button. The project we will create for this guide is called "Adult Income". To get started, download the Tableau Integration Example workflow from the EXAMPLES server. The workflow and associated dataset is available at EXAMPLES/05_Reporting/02_Tableau/01_Tableau_Integration_Example. Go ahead and execute the five nodes listed in the "Usual Modeling Steps" section. 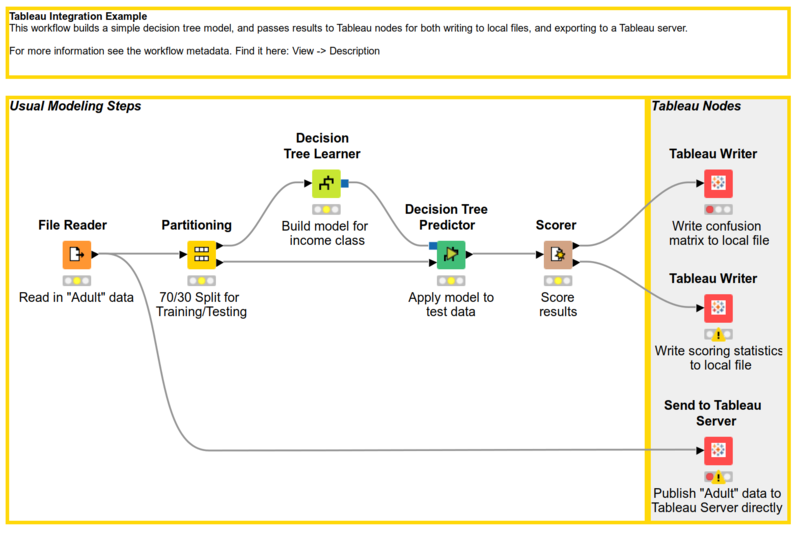 This is a workflow that reads in a file containing demographic and income information for a sample of adults working in the United States, and uses the decision tree node to predict and score income classification for the sample. Of more interest to us, the workflow also exports both the raw data and results of the decision tree model using Tableau nodes in a few different ways, which we will discuss in more detail below. This workflow is configured to work with the Tableau (Hyper) nodes, but you can easily swap those out to use the older Tableau (`TDE) nodes if needed. Now, we can execute the node, and a .hyper file is created. Files of this type can be imported into Tableau Desktop for further analysis, and from there, published to Tableau Server. .hyper files can also be published directly to a Tableau server by using Tableau’s command line utility tabcmd. We will discuss each of these methods below. `.hyper` files exported from KNIME Analytics Platform can be used directly with a installation of Tableau Desktop. Double clicking on the .hyper file will open the Tableau interface where you can begin construction of visualizations on the data right away. You can also publish the .hyper file for use in the Tableau Online environment via the desktop GUI. To do this, navigate to Server → Publish Data Source, assign a Project in the resulting dialog, and click Publish. This will make the data from the .hyper file available in the Tableau Online Environment. tabcmd publish "c:\path\to\file\Scorestats.hyper" -r "Adult Income"
The figure below presents the results of using tabcmd to publish a .hyper file using these commands. The tabcmd documentation, linked above, presents a more comprehensive list of available commands and options. 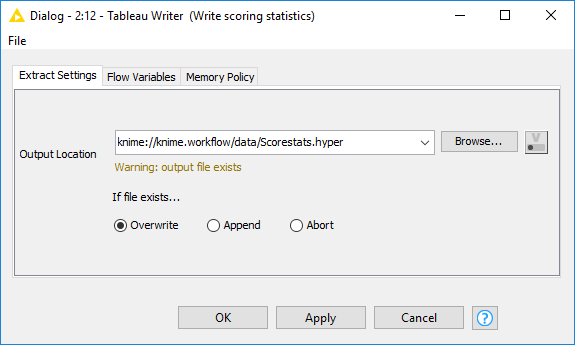 Perhaps you would like to skip the creation of .hyper files altogether, and instead send your data directly to Tableau Online from a KNIME workflow. 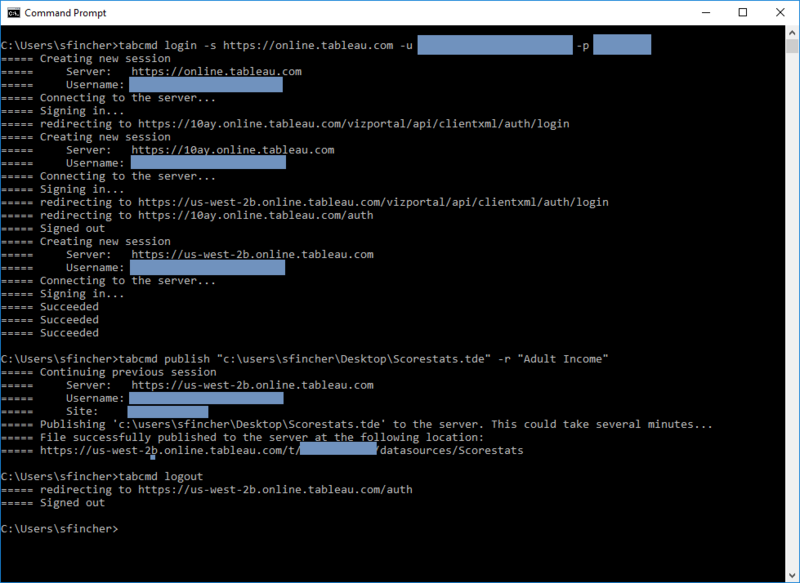 This can be done using the Send to Tableau Server (Hyper) node. For this example, we send the raw Adult dataset to our Tableau Online server for additional visualization. Double click the node to bring up the configuration dialog, and enter the required information under the Tableau Server Settings tab. Use the Browse button to have the node query the Tableau server for active projects. Here, we will be sending our file to the Adult Income project, and giving it a name of AdultRaw. Carefully note the format of the URL! Once your data has been published to Tableau, you are free to create your visualizations in the usual way. 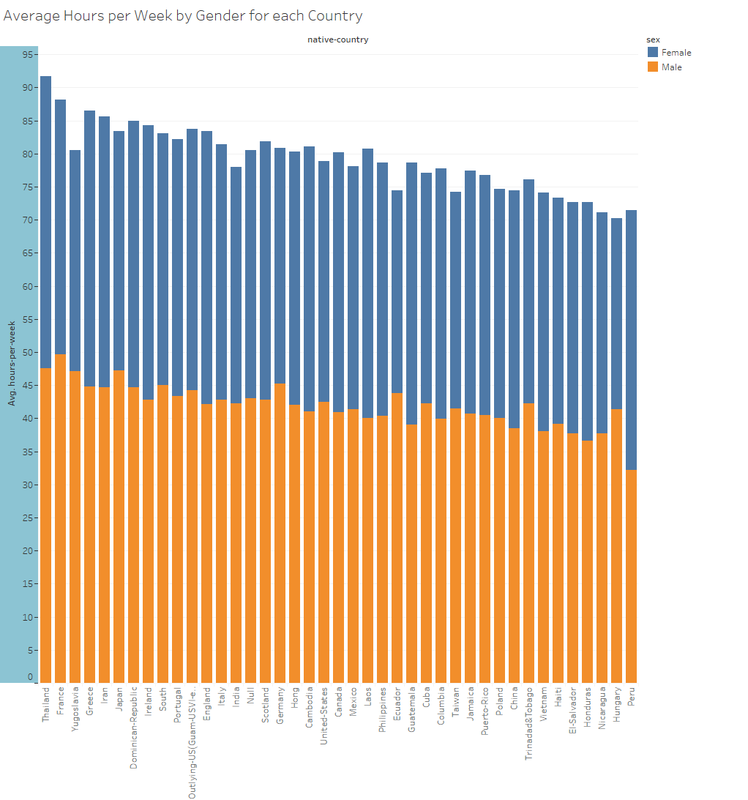 Here are a couple of examples generated from the Adult dataset.The first presents a map of average ages for adults in the data set, by country of origin. The second is a stacked bar chart that shows, in descending order, the total hours adults worked, by gender, in each country.